British science fiction action hero Dan Dare was created by artist Frank Hampson and his editor the Reverend Marcus Morris. Dan Dare first appeared in the Eagle comic story “Dan Dare, Pilot of the Future” from 1950 to 1967 (and subsequently in reprints); and was dramatised seven times a week on Radio Luxembourg between 1951–1956. Described as “Biggles in Space”, the original incarnation was seen by some as the British equivalent of Buck Rogers and Flash Gordon. 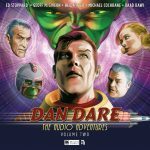 Dan Dare returned in new incarnations to suit new generations: in the 1970s in the British weekly, 2000AD; in the 1980s in the relaunched Eagle comic; in the 2000s as an animated series; and as a film project in the works in 2016. Creators who have worked on the character include writers Frank Hampson, Chad Varah, Allan Stranks, Pat Mills (founder of 2000AD), Tom Tully and Garth Ennis. Artists who have drawn Dan down the years include Frank Hampson, Don Harley, Bruce Cornwell, Frank Bellamy, Keith Watson, Ian Kennedy, Keith Page, Jon Warad and Gary Erskine. 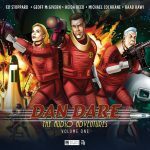 New comic strips featuring the original Dan Dare continue to be published in the magazine Spaceship Away.